C-Line has long been known as an industry leader in the photo storage and protection market. Our photo holders are made from the highest quality acid-free polypropylene material to ensure archival quality protection for your most treasured photo memories. Top loading access system to keep 3 1/2 x 5" photos safe and protected. Cherish every moment with C-Line! Insert Size: 3 1/2 x 5"
Awesome for my photo album project. I tore apart over 70 2" albums from my worldly trips. I wanted to save the best and toss the rest. Thousands of photos went in the trash. These pages were perfect for me to succeed for my goal. The ONLY thing BETTER, if they held 5 pictures (like they used to) . I have inherited a ton of photos and negatives from my father-in-law's estate. These photo sleeves have been great to help me get everything organized. Transcript: Welcome to MyBinding.com. These are the 3 1/2 x 5" Clear Polypropylene Photo Holders from C-Line. For long lasting photo presentation and protection, go with C-Line. Long known as an industry leader in photo storage, C-Line uses the highest quality, acid-free polypropylene material to guarantee archival quality protection for all of your treasured photographs. They also include perforated cardboard strips to write the date or description and insert underneath the displayed photo. Sized for photos 3.5x5” in a vertical orientation, each sheet will hold 8 photos back to back. Welcome to MyBinding.com. 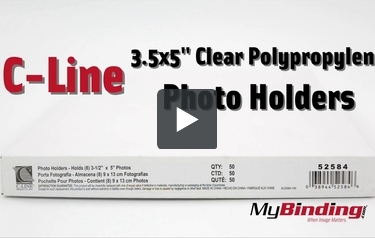 These are the 3 1/2 x 5" Clear Polypropylene Photo Holders from C-Line.